Today’s Famous Foodie is the French actor, Gerard Depardieu. The boy loves to eat so he learned to cook. The role that, as they say, put him on the map was his portrayal of a doomed, hunchbacked farmer in the film, Jean de Florette. He went on to win awards for his dramatic roles and when there was a need for some old French guy he acted in a few American productions, I'm thinking of Green Card. Don’t hate him! If you had bags of money you, too, would buy and vineyard and open a restaurant. OK, you would do the supermodel thing, too. 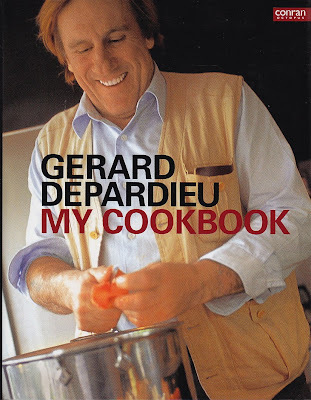 Depardieu took it a step further, writing his own cookbook, cleverly entitled, My Cookbook. As one might guess, the food is a very rustic French. The Revolution changed the course of French cooking. The bourgeoisie, the common man, made French cooking what it is today. The aristocracy had employed chefs, who now made food for the masses. Food became inexorable with French culture. As a child, Depardieu’s father made stews for the family. A favorite was cooked when a passing hunter would give his father a rabbit. Here is a rabbit much like his father made for him. Peel the shallots and garlic, leaving them whole. Strip the leaves fro the rosemary. Melt the butter in a large, cast-iron casserole. Add the pieces of rabbit and leave them to brown on all sides. When they are colored all over, add the white wine and water. Season with salt and pepper, add the rosemary, the shallots and garlic, then cover and coo for 1 hour, turning the pieces once or twice during cooking. Serve the rabbit straight from the casserole. There is nothing better than rabbit straight from the casserole! Now uncork some wine and settle in with a DVD of Green Card, or perhaps Bogus. In Last Holiday he plays a chef and you get Queen Latifah, so hush up and eat your rabbit. P.S. Once again, those rascally rabbits over at Cookbook Of The Day, stole our cookbook. 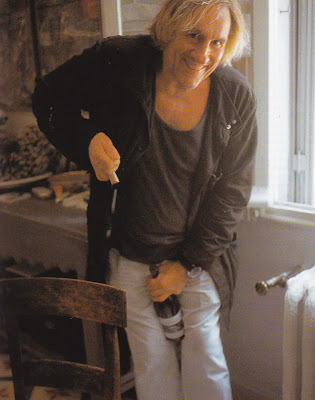 Those pictures of Depardieu are from his thinner days, it seems to me. He has been using his cookbook quite a bit, lately. And partaking of the bounty of his vineyard.